Aw, such a tiny little lamb. (I just went through all the photos I took during that visit and it made me feel all warm and fuzzy.) I remember helping my sister rock him to sleep during that last visit and he just looked up at me with his eensie little face and it melted the very core of me. (I have a feeling that this visit will either satisfy or completely escalate my baby fever. Watch out, Jay! You have been warned!) In any case, I can't wait to make some new memories with him, so hopefully I'm not just that random aunt in California who may or may not exist. I'm also looking forward to seeing the rest of my family and enjoying a pre-Thanksgiving, Thanksgiving dinner! 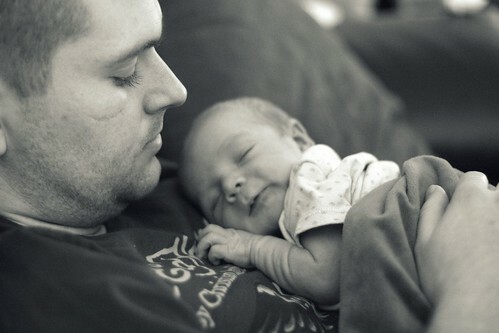 It is going to be amazing and to be honest, I really need some family time like this right about now. Especially with all my sisters. I've been rather deprived. My sister and her hubby are in baby-making mode, so this makes me even more look forward to the day she gets preggo and I have a little person niece/nephew to spoil! We are waiting on the arrival of our number 8 neice/nephew any day now and I am just desperate to start taking photo's! As I have not been in this blog world long I am looking forward to reading old posts. Have a truly fab time away and a lovely rest! Have a great vacation! We're leaving tomorrow to go home to California and I am giddy! If I see you at the airport, I'll wave! Awww have fun! get many many auntie kisses in there while you can! Oh he's learning how to walk now? HOW CUTE! I would totally be in baby gushing mode if I were you. He's such a cutie, I would be having a hard time not letting him go out of my arms lol so huggable. Have a great vacation! Have a great trip! Can't wait to hear all about it. It sounds like it will be so good to see them! Have a wonderful time! Have a great vacation! Enjoy the time with your nephew and family! Say hi to home for me! We'll see you at the airport! aww, i can't believe how FAST time flies, look at him all grown up!!!! CUTE! Have fun!!!! OMG! I could not be more insanely excited and happy for you and your trip tomorrow. Kyle and I (ok maybe its just me, because my family is the one who is out of town) do a sans-spouse trip about once a year too. I totally get that sometimes its nice to have that time with just you and your family. I'm also so excited for all the baby snuggles and love you'll be giving to your sister's little guy. He's so cute! I love all the pictures she posts too. Can't wait to see all your pictures when you return!! BTW... your comments you left on my blog recently cracked me up. I felt the same way about commenting on your blog in the beginning too. You have like, ADVERTISEMENTS on your blog! That's big time in my book. :-) Love ya! Guess what! I am going to Washington State too. I'll be flying out on Thursday and will stay for a week. Where in WA does your family live? I am actually going to see my in-laws (alone... weird, I know. But they are my family here!) in Oak Harbor, Whidbey Island. I am sooooo excited! Have fun!! Sister time is simply unmatched. It must be had! I hate not seeing my nephews and neices for so long and they get so big! Also, I've got a lovely award waiting for you on my blog! If you're in need of something to post, the challenge entails writing a "10 Facts About Me" kind of thing... which also coincidentally fits in with narcissism? NOT that what you're doing is egotistical. AT ALL. Haha, I should just shut up now. -_- Have a safe and super fun trip! This vacation came up so fast. I remember when we were eating pasta and vacation was just a twinkle in your eye. Anyway - have a wonderful time! And... I know this is strange... but I'm going to miss you. have so much fun! :) i'm in need of some serious vacation time ASAP, so i'm a little jealous. I'm so excited to see your new pictures of little Landon! He is such a little cutie pie! Oh my goodness, I don't know if I can even handle more baby cuteness! Adorable! Also, I hope you have the most fabulous time. Can't wait to see more pictures! 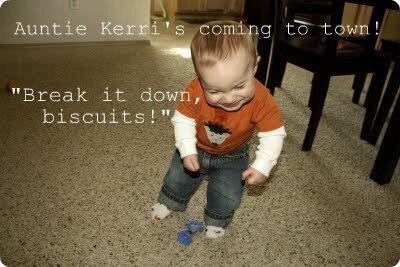 "Break it Down Biscuits" <--- You are freakin' hilarious! And that picture is too cute!